Blow-Up and Other Stories is a collection of short stories, selected from the short fiction of the Argentinian author Julio Cortázar. 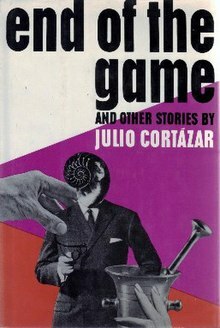 It was originally published in hardcover as End of the Game and Other Stories. The title story of the paperback collection served as inspiration for Michelangelo Antonioni's film Blowup. ^ This article refers to the 1967, 1963 Random House Copyrighted publication of the book by this name, as translated from the Spanish by Paul Blackburn, and published by Pantheon Books, New York. ^ By Pantheon, a division of Random House, 1967. Earlier publications included the Spanish volumes: Bestiario; Las armas secretas; and Final del juego. ^ Kester, Gary (1976). ""Blow-up": Cortázar's and Antonioni's". Latin American Literary Review. 4 (9): 7–13. JSTOR 20119031. This article about a collection of short stories is a stub. You can help Wikipedia by expanding it.